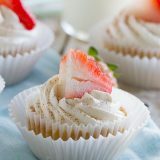 The classic Mexican dessert- Tres Leches Cake – goes single sized in these Tres Leches Cupcakes that would be perfect for any Cinco de Mayo celebration. Preheat the oven to 325ºF. Line 24 muffin tins with foil lined cupcake liners. Combine the egg whites, baking soda and salt and whip until soft peaks form. Add in the yolks and the sugar, and mix until combined. Gently fold in the melted butter. Add the flour in 4 batches, folding in after each addition. Divide the batter between the prepared muffin tins. Bake the cupcakes in the oven until lightly browned, and a tester inserted in the middle comes out clean, about 25 minutes. Remove the cupcakes from the oven, and using a skewer or fork, poke holes all over the top of the cupcakes. While the cupcakes are baking, combine the sweetened condensed milk, evaporated milk and 3/4 cup cream. Allow the cupcakes to full absorb the mixture, at least 30 minutes, but preferably overnight. To frost the cupcakes, beat the remaining 2 cups of heavy cream, slowly adding the powdered sugar. Beat until the whipped cream holds stiff peaks. Pipe the frosting onto the cupcakes, then sprinkle lightly with cinnamon and serve with a slice of strawberry on top.